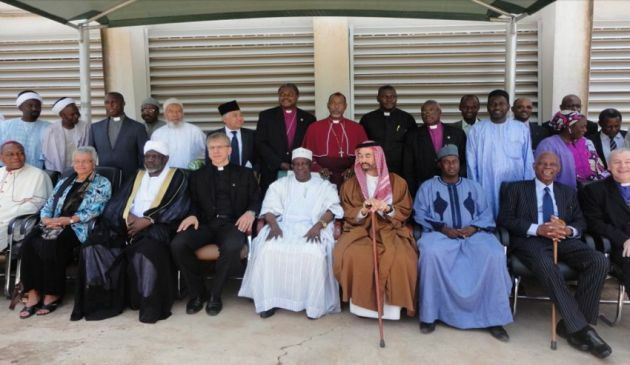 (Photo Credit: World Council of Churches/The Royal Aal al-Bayt Institute for Islamic Thought)The International Joint Delegation, whose participants were convened by the World Council of Churches and the The Royal Aal al-Bayt Institute for Islamic Thought, pose for a photograph in Kaduna, Nigeria along with its governor on May 23, 2012. Christian and Muslim groups have met in Switzerland to plan how to work together at a new inter-religious center working for healing and reconciliation in Nigeria set to launch in March 2016. Nigeria is Africa's most populous nation and of its181 million, Christians and Muslims are almost equally represented accounting for 90 per cent of the people, which has suffered from violent internal conflict since 2012. The meeting was held at the Ecumenical Institute in Bossey, near Geneva Switzerland on September 27 and 28, the World Council of Churches said in a statement. "Muslims and Christians can, through this initiative, hear each other's stories, share each other's pain, and begin to heal," said Rev. Olav Fykse Tveit, general secretary of the World Council of Churches. "This center is a significant common project for Muslims and Christian leaders in Nigeria and a pioneering work in inter-religious encounter." Although Christians and Muslims live throughout Nigeria the North is inhabited mainly by Muslims while southern areas are predominantly Christian. While Christians and Muslims cohabited peacefully for many years, the introduction of Sharia, an Islamic code of conduct, from 2000 in a number of northern states triggered communal tensions. And the subsequent rise of the terror group Boko Haram, which abhors modern education, and initially singled out Christians has wrought havoc and destruction for both Christians and Muslims in Nigeria. "In Nigeria the churches are constantly working in an inter-faith context," Rev. Yusuf Ibrahim Wushishi, the general secretary of the Christian Council of Nigeria, who is a Baptist and is from the north of the country. Institutions represented in Bossey were the Jordanian Royal Aal Al-Bayt Institute for Islamic Thought (RABIIT), the WCC, the Christian Council of Nigeria and Jama'atu Nasril Islam. The project has developed as a result of a high-level international inter-religious visit to Nigeria by representatives of the WCC and RABIIT in 2012. The governance, management and program of the center are intended to model Nigerian Christians and Muslims working together on issues of concern to all Nigerians. The phrase "In the sandals of the other" was proposed as a descriptive title for the center. In the first year of its operation, the center will work on supporting victims of violence who are suffering from trauma, with a particular focus on women and young people. It will also share examples of people working together to support each other across religious boundaries, as well as beginning substantial data collection. Participants of the meeting included Dr. Khalid A Abubakar, Lamya Al-Khraisha, Dr. Clare Amos, Dr. Usman Muhammad Bugaje, Sulayman Hart, Dr. Gina Lende, Rev. Emele Mba Uka, Rev. Yusuf Ibrahim Wushishi, Dr. Yakubu Joseph and Marietta Ruhland.